Whether you have goofed up an important assignment or late for a meeting, it is always better to apologize to your senior or boss. Not only is apologizing ethical, professional but also helpful for your professional image in the long run. 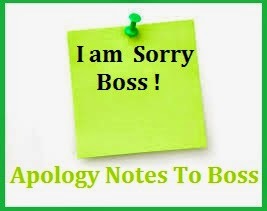 Read on to find the perfect sorry messages for Boss right here. Simply put your ego or timidness aside, and just be honest about admitting your mistake. 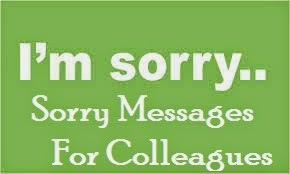 Go ahead and take cue from the following sorry messages to Boss and convey an apology message to your boss right away. I’m sorry for the no-show at the presentation today. I hope you will give me another chance to prove myself. I apologize for not preparing well for the presentation. I should have worked hard. I realize my mistake and will work on it. I am sorry for the poor presentation. I will improve it and give you the final draft by evening. I regret being unable to study all the facts. I assure that I will put in my best efforts next time. I agree that I have to work on the animations and graphics in the presentation. I should have studied the subject thoroughly. I apologize. I am sorry for coming late to office. I will try to be more punctual next time. 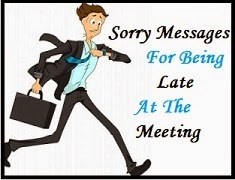 I apologize for being late for the meeting. I value your time. Appreciating your patience, kindly allow me to brief you about the topics for today’s meeting. I’m sorry I’m late. Do allow me a moment to brief you about the statistics for today’s agenda. I am sorry for being late. I will put in extra hours today and complete the assignment before time. Please accept my apology for coming late. I am extremely sorry for my rash, impulsive behavior. I realize my mistake for my outburst and apologize profusely for the same. I was upset for some personal issues and had an argument with my friend and colleague. No amount of words can express how sorry I feel. I am sorry I disrupted the office atmosphere today by raising my voice on my colleague. It was most imprudent of me. I apologize for my irrational behavior and would like to affirm that it wouldn’t happen again. I deeply regret my behavior at office today. I apologize for being unprofessional. I am sorry but I didn’t mean to be disrespectful. I sincerely apologize for hurting sentiments. I apologize for causing inconvenience to the office. I assure you that this mistake will not be repeated from now. I will be more cautious about the reports/presentation/appointment/meeting/deadlines. I am sorry for displaying an utter lapse of sense today. I take total responsibility for my actions and apologize once again for my unfounded behavior. I am really sorry. Though my conduct was unprofessional, I would like to put things in perspective to give you a better insight into the circumstances. Apologizing to a boss is like walking the tightrope. It is a more complex act than simply saying sorry to an office buddy. You made a mistake, be ready to face your boss with the consequence. Do remember that a humble and honest employee who knows how and when to admit mistakes is better than a prideful one. Saying sorry to your boss is an initial step. Be sure to provide an assurance that it will never happen again. 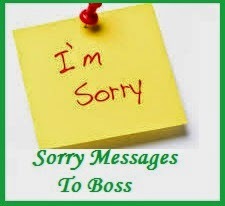 These sample sorry messages to boss may be able to help you get you through that difficult step. I’ve put the company in an embarrassing light. I am sorry this happened. I can turn things around to our favor, I promise. My poor presentation did not impress our client - that I admit. I am sorry for the blunder. I should have prepared more. It won’t happen again. I want to blame our supplier for the delay in shipment, but when I reviewed our correspondents, it was a lapse in judgement on my part. I’m sorry for this event. I will be more diligent next time. It was a total oversight on my part regarding the maintenance of our copier machine. I’m sorry about this. I’ve already arranged for the service of the machine first thing in the morning tomorrow. My insensitive actions towards my subordinates was uncalled for. I am sorry about the outburst that affected the morale of our staff. I was having a bad day, and I realize now that I should not take my problems to the office. Damage has been done, and I’m to blame on the failure of coordination with our marketing team. I am sorry. I know this will reflect on my performance. I will do everything I can to turn things around. I’ve realized my blunder now that the sales have dipped. I should have taken your advice. I’m sorry for taking another path as it seemed to be the right move that time. I will never question your wisdom again. In my eagerness to prove myself, I have neglected being a team player. This has cost the company valuable time and productivity. I am sorry for this blunder. I now realize the value of teamwork. I am embarrassed for losing our potential client due to lack of research on my part. I have been careless and I’m am very sorry for this. I will do better now and in the future. Hoping for your consideration. Defending my actions will only be in vain. I am sorry I was not able to attend today’s important meeting. I know you were counting on my inputs on the project. I will be diligent next time. I’m sorry for not seizing the opportunity to increase our sales this season. I was reluctant since we’ve already reached quota. I’ll be more aggressive in the future. I’ve been covering up for our manager since I believed in him. This now proves that it was a lapse of judgement on my part. I’m sorry about the matter. I only thought he had the potential this company needed. My team only did what they were instructed to do. I take responsibility for their actions. I’m sorry our plans did not pan out. I was overzealous at hitting our quotas early. I’m sorry I was awfully late the other day. I had one of those bad hangovers and I didn’t want to push it and disrupt the office workflow. I hope for your kind consideration. I am accountable for the lost revenue for this week. I am sorry. I was trying to beat the deadline and my plan simply backfired on me. Rest assured this was done in good faith.